The Culture property can be set using the drop down list in the Properties Window or set in code. The screenshot below shows the Culture property set to "French (France)". 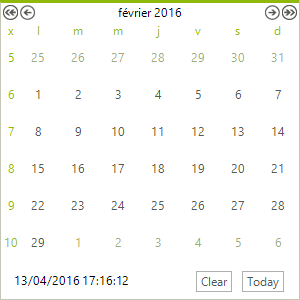 Figure 1: RadCalendar with French culture. DayNameFormat Specifies the display format for the days of the week on RadCalendar. Values for this property are Full , Short , FirstLetter , FirstTwoLetters , and Shortest . Culture Gets or sets the culture supported by this calendar. CurrentCalendar Gets the default System.Globalization.Calendar instance as specified by the default culture. DayCellFormat Gets or sets the formatting string that will be applied to the days in the calendar. The default value is "%d". FirstDayOfWeek Specifies the day to display as the first day of the week. Valid values are Default , Sunday , Monday , Tuesday , Wednesday , Thursday , Friday and Saturday . TitleFormat Gets or sets the format string that is applied to the calendar title. The default value is "MMMM yyyy". CellToolTipFormat Gets or sets the format string that is applied to the days cells tooltip. The default value is "dddd.MMMM dd, yyyy". DateRangeSeparator Gets or sets the separator string that will be put between start and end months in a multi view title. The default value is " - ".